This is the eighth in a series of posts on unity in the United Methodist Church. This series of blog posts originally appeared on David W. Scott’s personal blog, Posts from the Frontier. The posts have been lightly edited and are being republished here. For the last two weeks, I’ve been talking about something I’ve called the aggregate model of unity: a model of unity that depends not upon some characteristic shared by all as the basis of unity, but rather sees unity as being built up through a bunch of overlapping social circles. Today, I want to talk about the role of networks and bridge-builders in this model of unity. Here, the overlapping smaller circles are social groups (or other relevant, relational groups), and the heavy black circle is the organizational boundary of the overall group. 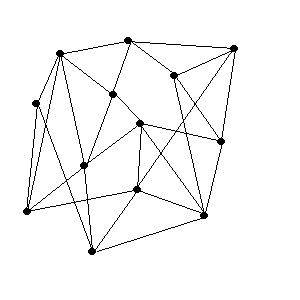 This diagram looks not like a bunch of circles but rather a network, a series of connected points. Each point is a different social group or relevant, relational group that makes up part of the overall group. Hence, the aggregate model of unity is also a networked model of unity. Not every point in the network is connected to every other point, but to be part of the network, each point must be connected to some other point, and preferably to several other points. What are these connections? They’re the same thing as the overlaps in the circle diagram: people who are part of more than one group. These individuals, whom we might call go-betweens, cross-cultural agents, or simply bridge-builders, are what hold the various points of the network together. They are what provide the unity in this model. To be a true bridge-builder, though, a person must do more than just have membership in two different groups. They must work to connect these groups to each other in some way, whether that be by elaborating shared values, projects, language, goals, or just some sense of affinity. Establishing such connections requires a variety of skills and characteristics on the part of the bridge-builder: trust from both groups, an aptitude for understanding each group, the ability to translate between groups, and a knack for building relationships. Bridge-builders then are crucial to having unity within larger societal groups, be they The United Methodist Church, the United States of America, or some other group. Unfortunately, they also seem to be in short supply nowadays. We hear more and more about the polarization of the church and American political society. In the church, liberal and evangelical groups have distinct and usually non-overlapping memberships. In American politics, the most conservative Democrat and the most liberal Republican no longer overlap, as they used to do. Without any overlap, without any bridge-builders, there is no sense of unity. We become a polarized people. We are left to fight about the money and power involved in the formal structures that hold us together, be that denominational structures or governmental structures, without any sense that this money and power could be used in ways which can benefit all. If we want to be able to hold together and work together as a larger group, we desperately need people who can be bridge-builders, who can act as go-betweens between different groups. We need them in the church, and we need them in the broader society. Let us pray that there will be some who will answer this call.